BOSTON – Framingham senior Ben Burgess won the mile event at the Bay State Conference meet today, February 6 at the Reggie Lewis Center in Boston. His time of 4:24.79 minutes was a personal record. Burgess will next compete at the Division 1 meet. Two Framingham Flyers finished in the top seven in the 55 meter dash at the Conference meet, said head coach Chris Collins. Senior Jon Lam took fourth place in 6.91 seconds. The winner was Needham’s Tommy Jordan in a personal best 6.69 seconds. Framingham senior Nick Seeto finished seventh overall in 7.02 seconds. Seeto has already qualified for the Division 1 meet. Lam, is on the bubble to qualify for the dash. The top 30 times qualify. Coach Collins said Lam may qualify for the 300 meter race in Division 1, but again they have to wait for all the times to be recorded. In yesterday’s Bay State Conference meet Jordan won the 300 meter event in 35.81 seconds, a person record. 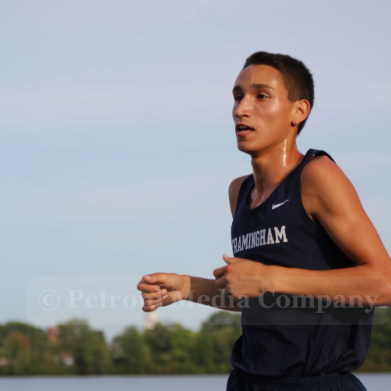 Framingham’s top runner was Lam in 37.33 seconds. He finished sixth overall. Framingham junior Zach Blumer was 11th overall in a personal best 38.72 seconds. Junior Angel Martinez was 13th overall in 39.31 seconds in the 300 event. Sophomore Ryan McIrney was the fastest Flyer in the 600 meter race in a personal best 1:35.52 minutes. He finished 18th out of 22 runners. Brookline’s Jon Diaz won the 1,000 meter event in a personal 2:34.27 minutes. Framingham junior Lucas Marshall finished 16th overall in 2:55.11 minutes. Framingham freshman Shand Seiffert was 17th overall in a personal best of 2:55.34 minutes. Sophomore Sam Moffart finished 12th out of 20 runners in the 2-mile event. His time was a personal best at 10:49.21 minutes. In the preliminary round of the hurdles, Flyer sophomore Sed Lomani finished 11th overall. The top 8 qualify for the finals. His time was 8.72 seconds. 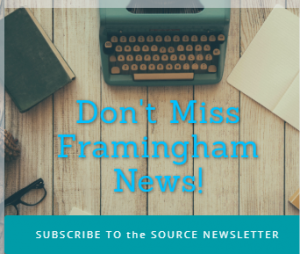 Framingham was disqualified in the 4 by 200 meter relay and did not have a team in the other two relays in the Conference meet. In the field events, Newton North senior Henry Sobieszczyk won with a throw of 51-feet and 4.25 inches. Freshman Miles Bishop finished 9th overall for the Flyers with a throw of 38 feet and 8.5 inches. Junior Brad Woodhouse was 12th overall at 37 feet and 3-inches. Framingham sophomore Ryan Maliewski finished 14th overall in the long jump with a leap of 16 feet and 9 inches.